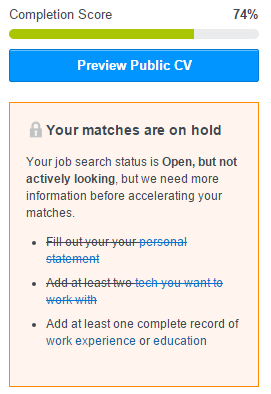 I have completely filled out my CV, yet the page says it is still on hold because I haven't added a complete work experience. The problem is, I've added three. If "complete" indicates that the entries I've added are insufficient, I have no idea what makes them insufficient and the UI doesn't tell me that there is an issue when I edit them. We have been working on refining the CV editor and we missed one of the edge cases. Thank you for reporting this, Tyrsius! This is fixed now.